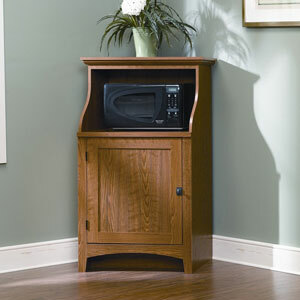 Sleek and stylish, this Sauder Summer Home Gourmet Stand in Carolina Oak is a wonderful addition to your home. It is made of durable manufactured wood and the base flaunts a Caroline Oak finish, which complements most home decors. It features a cabinet with two shelves behind its beaded door panel. The top acts as a shelf and you can keep small kitchen appliances on this stand. This gourmet stand is eco-friendly, ensuring it has minimal impact on the environment. This Summer Home Gourmet Stand in Carolina Oak by Sauder is a blend of beauty and functionality.